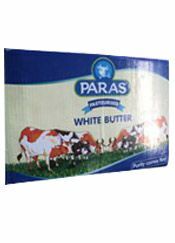 Paras White Butter is produced from fresh pasteurized sweet cream. This is manufactured by maintaining strict by genic standard and is untouched by land during production & packaging. Pure butter derived from milk is without added any chemicals. 20/25kg corrugated box of 7 ply with inner polyethylene liner. Product can be stored for 12 months from date of manufacture.it should be stored and shipped in a cool, dry environment, at -18°C.it should not be exposed to direct sunlight and should not be in contact with walls or floor, so as to enhance shelf life. Butter must be transported in refrigerated containers at the appropriate temperature. The Usual capacity of a 20 feet container is 12.5 MT and 40 feet container is 25MT in refrigerated container only.